When President Trump took office last January, he announced aggressive goals affecting federal environmental law and policy, including deregulation, energy independence, economic growth and streamlined permitting. How did the administration fare in 2017, and what can we expect for 2018? While the administration highlights its deregulatory successes, many aspects of its environmental agenda have drawn strong opposition from environmental advocacy groups and certain states. The administration has taken steps toward significant rollbacks, including the proposed repeal of the Obama administration’s Clean Power Plan, and the proposed revision of the “Waters of the United States” (“WOTUS”) rule. In inviting public comment on these and other regulatory actions, EPA has made its legal and policy case. For example, the administration estimates that repeal of the Clean Power Plan is consistent with EPA’s legal authority under the Clean Air Act, and will eliminate up to $33 billion in compliance costs as of 2030. In reviewing and revising the WOTUS Rule, EPA seeks to minimize regulatory uncertainty while providing due deference to the states’ role in carrying out the goals of the Clean Water Act. The current administration’s push to roll back environmental regulations has not been entirely smooth. For example, back in July, the Clean Air Council successfully challenged Administrator Pruitt’s attempt to temporarily suspend oil and gas methane emission standards promulgated in 2016, which include methane leak detection and repair requirements, pending reconsideration of the rule. The U.S. Court of Appeals for the D.C. Circuit in Clean Air Council, et al. v. Scott Pruitt, No. 17-1145 (D.C. Cir. July 3, 2017), found that Pruitt lacked authority to stay the rules in the absence of a required (rather than discretionary) reconsideration under the Clean Air Act. 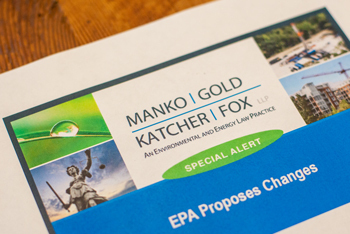 EPA has proposed a longer-term delay of the standards pending completion of its reconsideration process. The proposed delay has been subject to public notice and comment and is being watched very closely by industry and environmental groups alike. EPA faces significant budget and personnel reductions, in furtherance of the administration’s goal of defining the appropriate federal role of environmental protection while supporting the agency’s focus on core statutory work. President Trump’s proposed EPA budget for FY 2018 is $5.65 billion, $2.6 billion less than the FY 2017 budget for the Agency, and carries with it steep program cuts and job eliminations. While the administration has promoted cooperative federalism between the federal government and states and tribes, these budget cuts signify a potential strain on state environmental programs that have been funded at least in part by EPA. On the enforcement front, however, EPA has pledged to work closely with states to promote compliance and to address environmental violations, with delegated states taking the enforcement lead in most cases. At the beginning of his tenure, Administrator Pruitt signaled his interest in efficient site cleanups, and EPA indeed focused a fair amount of attention on the Superfund program in 2017. In May, Administrator Pruitt issued a memorandum directing agency management to prioritize the Superfund program, and created a Superfund Task Force charged with reviewing the status of the program with the goal of expediting cleanups, reinvigorating efforts by potentially responsible parties, encouraging private investment to facilitate cleanup, promoting redevelopment, and engaging with stakeholders. The Task Force issued a report of its findings in July, which called for the identification of sites to be placed on a high priority list that will be targeted for immediate and intense attention directly from Administrator Pruitt. The recently released list includes sites in the mid-Atlantic region, such as the American Cyanamid Co. Site in Bound Brook, NJ; the Diamond Alkali Site in Newark, NJ; and the Ventron/Velsicol Site in Wood Ridge, NJ. In terms of new EPA personnel, only the Regional Administrator position for EPA Region 9 remains open. The rest of the positions have been filled, including Alexandra Dapolito Dunn appointed as Region 1 Administrator, Peter Lopez as Region 2 Administrator, Cosmo Servidio as Region 3 Administrator, Trey Glenn in Region 4, Cathy Stepp named for Region 5, Anne Idsal for Region 6, Jim Gulliford in Region 7, Doug Benevento in Region 8, and Chris Hadlick in Region 10. Important posts have been filled at headquarters, including Bill Wehrum as the Assistant Administrator for the Office of Air and Radiation, Susan Bodine as Assistant Administrator for the Office of Enforcement and Compliance Assurance, David Ross as Assistant Administrator for the Office of Water, and Matt Leopold as EPA General Counsel. Looking forward to 2018, we can expect EPA to pursue its proposed repeal of the Clean Power Plan, its revision of the WOTUS, and deregulatory actions on a host of other federal environmental rules that have been subject to delay or proposed repeal. EPA appears to be moving forward with considering a replacement to the Clean Power Plan, with the release on December 18 of an Advance Notice of Proposed Rulemaking requesting public input on a potential replacement rule. The administration’s Unified Agenda of Regulatory and Deregulatory Actions signals the administration’s continued focus on the reduction of regulatory burdens and costs and sets a “better than 2:1” goal for 2018, with plans to finalize three deregulatory actions for every new one in FY 2018. With the fate of several federal rules still uncertain, environmental groups and states will continue to take an active role in providing feedback to the agency, and in evaluating impacts to delegated and parallel state programs. Of particular note for manufacturing facilities, EPA has recently announced its intention to evaluate reforms to the Clean Air Act New Source Review pre-construction permitting program. We can also expect EPA’s focus on the Superfund program to continue with Administrator Pruitt’s direct participation and oversight of priority sites. A detailed analysis of The Trump Administration and EPA by McCabe and Colón originally appeared in The Legal Intelligencer article on January 11, 2018.